FABTECH is North America’s largest metal forming, fabricating, welding, and finishing event, and it’s right around the corner! Chicago’s McCormick Place is set to host thousands of exhibitors and over 50,000 attendees November 6-9. This massive tradeshow is full of innovative products, enthusiastic shop owners, and a network of shop industry giants. FABTECH debuted in 1981 in Cleveland, Ohio. The first show had 161 exhibitors present and used 42,925 square feet. FABTECH annexed a couple of separate shows over the years, such as the AWS Welding Show and METALFORM, which became co-sponsors of the show. Within 40 years, the show has grown to 1,700 exhibits and over 750,000 square feet. This year, FABTECH is bringing a much needed addition to the show: a new 3D/Additive Manufacturing Pavilion. Recent years have demonstrated a rapidly growing interest in technology among the event attendees, so FABTECH delivered. The 3D/Additive Manufacturing will feature more than 25 exhibits, networking events, and presentations throughout the duration of the show. There are many other divisions of FABTECH alongside the new 3D/Addative manufacturing Pavilion that are worth a visit as well, including the Forming and Fabricating Finishing Metalform floor. That’s where you’ll find Shoptech representatives and the E2 Shop and Manufacturing systems! 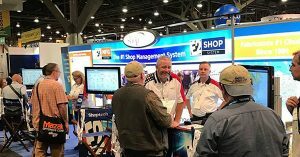 At BOOTH A4413, you’ll have the opportunity to ask questions about the ERP industry, discuss your shop’s sore spots, and test drive the E2 system that will best fit your needs. In addition to exhibiting at FABTECH, Shoptech is proud to be a part of the MetalForming Magazine FABTECH special. The article, titled “Job-Shop-Management Software Can Pay Off Big Time”, features a great interview of senior vice president and co-founder of the company Greg Ehemann. Ehemann discusses the ways in which the E2 system helps companies increase their productivity and ultimately increase their profits. Ehemann says that ERP systems help bring control into chaos, addressing problems such as tracking jobs, on-time shipments, and even projections for new or adjusted work. If you aren’t able to make it to FABTECH this year, be sure to check out the article; and if you are at FABTECH, pick up your free copy! To add to the excitement of the weekend, if that is even necessary, FABTECH has a special treat for everyone in attendance. Jesse James of West Coast Choppers has teamed up with renowned metal sculptor Albert Paley to create two masterpieces for display at the show. Each started a metal sculpture and then passed it to the other to complete. These collaborative pieces will be unveiled at the beginning of FABTECH and stay on display for the remainder of the event. A documentary is also in the works that follows the process of each artist, and it will be available after the tradeshow. Shoptech’s E2 experts can’t wait for this great opportunity to meet so many of our fellow shop industry members. Whether you’re a current customer or new to the ERP search, stop by BOOTH A4413 and say hi! We are ready to get to know you and your company, as well as find the product that will fit your shop’s needs.